I am absolutely flabbergasted that Barbara Flohr would make such negative comments about science education, criticizing a nonprofit organization for encouraging students to participate in science fairs and deriding President Obama’s efforts to increase funding for basic science research (C&EN, March 26, page 4). I understand the frustration of having a loved one unemployed. But such an attitude is counterproductive. Although it is true that ACS members are experiencing the highest level of unemployment since 1972, that level, 4.6%, is relatively small when one considers that the overall unemployment rate in the U.S. is currently 8.3% (C&EN, March 26, page 10). The glass is 95.4% full, yet Flohr is focusing on the empty portion. Instead, Flohr should focus on encouraging her daughter to take some positive steps that could enhance her career, such as the following: Consider earning an advanced degree at a top college; concomitantly broaden that chemistry background (e.g., pharmaceutics). Intern at an institution that advances one’s knowledge base and marketability. Participate in professional organizations and become an invaluable member of committees. Develop an international network of professional friends. Publish and present at every opportunity. Be open to moving anywhere in the world to get a job that advances one’s career and knowledge base. If the job is outside the U.S., learn the language and culture. Ensure that the résumé is complete. Remember that human resources personnel may be searching for keywords, which they may not understand. Your résumé may be selected based on acronyms like IR, HPLC, NMR, GC, MS, IND, NDA, PLGA, MAA, etc. If infrared spectrometry appears in the résumé but IR does not, there is a fair likelihood that that keyword will be missed on an HR search. Above all, keep a positive attitude. Institutions want to hire scientists who are not just smart but also enthusiastic, energetic, and hardworking. Since 1976, when I received my doctorate, my career changes have always been focused on finding jobs that challenged me to learn new fields within science. My first six years after graduation were financially quite difficult. But I broadened my career; I learned to synthesize new drugs, test them in vitro and in vivo, radiolabel the molecules, and follow the pharmacokinetics of key actives. I loved that poor-paying job! Science has given me a wonderful career! My advice: Seek knowledge, love science, and all else will follow. Perhaps Dr. Marsh is unaware that the 4.6% unemployment for ACS members was measured in March 2011 and the latest BLS number is 6.1% (estimated over the entirety of 2011) -- perhaps the glass is 93.9% full. Maybe Dr. Marsh is not aware that the latest number for unemployment (2009 data) for new B.S. chemistry graduates is 15% -- and so the glass might be 85% full. Or perhaps Dr. Marsh does not recognize that Mrs. Flohr's daughter is unemployed, and so for her, the glass is 100% empty. I'm amused at Dr. Marsh's laundry list of ideas to improve Mrs. Flohr's daughter's chances of getting a job in chemistry. Some of them (the resume keywords) are eminently practical. Some of them ("become an invaluable member of committees") are odd, interesting and have more of a long-term payoff. Some of them ("Be open to moving anywhere in the world") are easy to recommend to other people but a lot more difficult to implement. I am curious to know if Dr. Marsh decamped to other countries during his long career. Finally, "I loved that poor-paying job!" and "Science has given me a wonderful career!" are cold comfort to people who are suffering now. While "all else will follow" may have worked for Dr. Marsh, I suggest that this era in the American chemical enterprise may be different, and past performance is no guarantee of future performance. Nevertheless, a global manufacturing enterprise with increasing international competition is here to stay. Unfortunately for chemical professionals, it’s not just shop-floor manufacturing and assembly jobs that have moved from the U.S. to Asia and other areas; in recent years the movement has included upper-level, sophisticated work such as chemical research, drug discovery, process design and development, and various levels of management. In addition, domestic capabilities have increased enormously in developing countries such as China, India, and Brazil, as has their output of homegrown scientists and engineers. [snip] Growth in the U.S. will not be fast enough to make up for all of the lost positions in the pharmaceutical and chemical industries over the past few years, in part because many of these losses have not been solely determined by economic decline. Rather, there have been strategic shifts to place work in other countries, and there is no reason to expect those decisions to be reversed. The keys for many chemical professionals will have to be imagination and flexibility. I am a firm believer in the need for all citizens in modern technological societies to have a strong grounding in science and math, so I would never discourage anyone from pursuing a chemistry degree. What one thinks about doing with that background, though, should include much more than just scientific research. Chemists develop lots of skills, and those skills can be applied in medicine, high school teaching, forensics, science writing, legislative work, policy analysis, quality assurance, regulatory support, and more—much more than just R&D in universities or industry. This is a groundbreaking comment for a member of the Board of Directors of the American Chemical Society to make; Dr. Chamot is to be praised and thanked for being willing to state such unpopular and unpleasant facts. I don't really have anything to add to it (other than a sense of skepticism at the alternative careers pathway). While we can argue about the speed at which ACS and C&EN have approached the #chemjobs issue, it is becoming increasingly clear to me that many people are coming around to the same set of facts and all that remains (all!) is to discuss what is to be done about it. That's a start. "...on a planet similar to ours without the asteroid collision it is unlikely that human types would be there, more probably advanced lizards (dinosaurs)... I just warn that they might well see us as food." This news has struck Washington's defense community as a threat to be responded to. In response to queries, Dr. Jonathan D. Router of the Extraterrestrial Threats Institute noted that "If Professor Breslow is to be believed about the space dinosaur threat, we should be able to safely predict that these advanced lizards have also achieved intrastellar space flight. Our innocent, blue planet is completely defenseless against the space dinosaur threat and their ravenous ways. We need to prepare against this menace." General Marcus Wolfson of SPACEDINOCOM (a sub-command of NORTHCOM) noted, "With the budget cuts that the Pentagon has been facing, we've scaled back our extraterrestrial threat defenses. We're really glad that Professor Breslow has warned the general public about these issues." When reached for comment, lawmakers would not talk on the record; a distinguished senator was granted anonymity in order not to reveal conversations within Congress. Said the senator, "It's our understanding that SPACEDINOCOM is interested in setting up a base and a new section of NORTHCOM titled the Space Dinosaur Defense Forces. That base would be a real boon to our economy -- also, we'd like our state to be best defended against space dinosaurs. Wouldn't you?" When pressed for details on potential defense strategies, General Wolfson would only reveal the following: "We understand that their chemical makeup may be the mirror image of ours. We believe this is the key to our defense, and so we've set up a chemical synthesis laboratory to develop mirror image biomolecules (amino acids and sugars) such that we could better understand their biology and develop offensive techniques. We understand that there are a lot of unemployed chemists, so we're expecting to be able to hire people quickly to begin to deal with this threat." On Martin Mackay -- when does your record become your record? With the news that AstraZeneca has removed its CEO this morning, I'm reminded of another AZ honcho, president of R&D Martin Mackay. I note that I pseudo-worked for the Blue Pill Factory's R&D division while he was the president of Global R&D; he seemed like a nice fellow in his public appearances, but I don't really know his successes or failures. During his tenure as president, there were at least 2 rounds of layoffs. 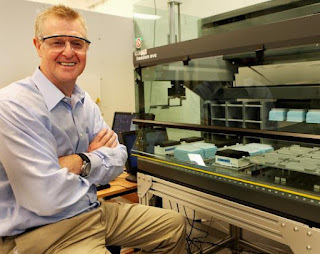 He's since moved to AstraZeneca, where he appears to be making a number of interesting moves, including changing many research heads and forming a new virtual neuroscience collaborations group, which seems to have the unfortunate name of iMed. * There have been, of course, rounds of layoffs in the R&D divisions. Layoffs aren't always their fault, for sure -- shareholders, CEOs, the board probably has some role in demanding 'reductions in headcount.' Also, the discoveries and successes of the scientists in their organizations aren't necessarily theirs, either. But through their "go/no-go" decisions and their personnel moves, they do have some impact on their organizations. My question about Dr. Mackay and other heads of large pharma R&D: at what point are they responsible for the scientific success of their respective companies? In the American football world, "true" coaching success seems to be described as: winning games and championships with players that you have selected, as opposed to winning with players that have been selected by previous coaching staffs (think Jon Gruden's early success versus his later years.) The common rule of thumb for judging the success of college-level coaches is the results of their 3rd or 4th full season. Is 3 years enough for heads of R&D? So when do we get to judge Dr. Mackay's tenure at either Pfizer or Astra-Zeneca? And what constitutes a failure to succeed, such that the reins of large research organizations get taken away from them? *This is a continuation of common thought that anything having to do with Apple is the height of technology and innovation. I'm less than convinced with this marketing decision. Every day, 12 workers die on the job across America. As the nation's secretary of labor, I am surrounded by numbers about jobs, the labor market and about the economy more broadly. But the number 12 stays with me. It is a haunting reminder of the hard-working Americans we lose every day, often in the prime of their life, filled with the energy that we need to build a better world. Sheri Sangji was one of these Americans, so full of promise. She was a 23-year-old research assistant in a lab at the University of California at Los Angeles, looking forward to a career that would allow her to pursue her interests in chemistry, law and the rights of women and immigrants. One day, while performing an experiment with highly reactive chemicals, a flash fire ignited her clothes and skin, causing fatal burns. Sheri had not been properly trained in the handling of the chemical that set off the blaze. I later met her family, a loving and tight-knit group of people. The weight of their loss was nearly unbearable. I think about them every day. To remember Sheri Sangji and all others who die on the job across our country, we observe Workers Memorial Day every April 28. Today, we remember families who have lost a loved one because of workplace injuries, and we pledge to continue fighting tirelessly to make sure that no worker trades a life for a livelihood. I don't have much to say about this, other than to praise the writer's accuracy as to the facts of the #SheriSangji case. Nicely done. Good morning! Between April 24 and April 25, there were 23 new positions posted on the ACS Careers website. Of these, 4 (17%) were academically connected and 12 (52%) were from Kelly Scientific Resources. Plymouth, MI: Conestoga, Rovers and Associates is an environmental services firm; they're looking for a B.S. chemist with 3-5 years of environmental laboratory experience. QA/QC background desired. Tarrytown, NY: BASF is looking for a B.S./M.S/Ph.D. 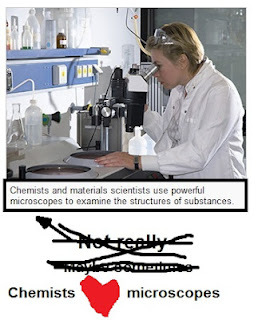 chemist with descending (respectively) levels of experience (zero! to 3 for the Ph.D.) for a position as an applications scientist. Thermosetting plastic, polymer additive and polyolefin strengths desired. Roseville, CA: PASCO Scientific is a company that creates science education activities for middle and high school students. They're looking for a B.S. scientist to be a curriculum and training developer. Looks interesting, pays not too bad. Work directly with PhD level chemists to help synthesize, formulate and/or test novel resins/polymers in a variety of experimental Navy coatings in a laboratory setting. Operate spray equipment, prepare test samples, maintain a chemical inventory, order supplies, record and tabulate test data, and generate basic SOPs. Prepare technical reports and presentations as necessary. As projects mature, work with other groups to share formulation and application expertise developed within the laboratory. This combines a need for an understanding of coatings chemistry, good lab skills, familiarity with coatings application equipment, and an interest in the entire coatings development process from concept to shipboard demonstration. A broader look: Monster, Careerbuilder, Indeed and USAjobs.gov show (respectively) 260, 756, 3,050 and 35 (a bit of a dip) positions for the search term "chemist." The unemployment rate for PhDs in 2011 was 2.5%, and the median weekly earnings were $1551 (> $80,000 per year). This is much greater than any other level of educational attainment other than professional degrees (law, medicine, etc). There is only “overproduction of PhDs” if you assume that PhDs are only being produced to become faculty members who go on to train additional PhDs. ...The fact that many institutions are cutting back their production of PhDs for fiscal reasons is far from salutary, and in the long run is going to severely harm the competitiveness of the US economy as compared to other advanced and developing economies whose politics aren’t grossly distorted by deranged racist misogynist white jeezus-freak lunatics. In my other wanderings on the internet, it seems that Comrade Physioprof's response is a fairly common response from those who are academically connected: the college wage premium continues to justify going to college. But as the financial industry likes to remind me when I'm signing checks over for my Roth IRA, past performance is not indicative of future results. CPP is pointing to all employed Ph.D.s and attempting to use those numbers to argue about the most recent cohorts. Overproduction is best indicated by salary trends and not by single data points; I am unmoved by Comrade Physioprof's reasoning. Economic forces in the world beyond your graduate program might be such that there aren’t as many jobs suited to your Ph.D. chemist skills as there are Ph.D. chemists competing for those jobs. Among other things, this means that earning a Ph.D. in chemistry does not guarantee you a job in chemistry on the other end. To which, as the proud holder of a Ph.D. in philosophy, I am tempted to respond: join the club! Indeed, I daresay that recent college graduates in many, many majors have found themselves in a world where a bachelors degree guarantees little except that the student loans will still need to be repaid. To be fair, my sense is that the mismatch between supply of Ph.D. chemists and demand for Ph.D. chemists in the workplace is not new. I have a vivid memory of being an undergraduate chemistry major, circa 1988 or 1989, and being told that the world needed more Ph.D. chemists. I have an equally vivid memory of being a first-year chemistry graduate student, in early 1990, and picking up a copy of Chemical & Engineering News in which I read that something like 30% too many Ph.D. chemists were being produced given the number of available jobs for Ph.D. chemists. Had the memo not reached my undergraduate chemistry professors? Or had I not understood the business model inherent in the production of new chemists? I haven't had time to formulate an appropriate response -- needless to say, go and read the whole thing. Good morning! Between April 19 and April 23, there were 81 new positions posted on the ACS Careers website. Of these, 8 (10%) were academically connected and 50 (62%) are from Kelly Scientific Resources. Frederick, MD: SAIC is looking for a Ph.D. chemist with experience in analytical chemistry and/or material science to characterize nanomaterials. Sounds futuristic. North Brunswick, NJ: Chromocell Corporation is looking for a M.S./Ph.D. flavor chemist with 5+ years in the field. Candidates are sought to fill a research position in the area of nanomechanical characterization with scanning probe microscopy (SPM) based methods. The candidate will conduct research with state-of-the-art SPM instrumentation (including nanoindentation) to develop novel methods in quantitative and semi-quantitative characterization of elastic and viscoelastic materials. The position is primarily experimental-based but will also include simulations of tip-sample interactions and incorporate use of contact mechanics modeling to improve data interpretation. A Ph.D. in materials science/applied physics/physical chemistry/ materials or mechanical engineering and a demonstrated ability to perform independent research is required. A strong background in scanning probe microscopy with a proven track record in research is essential. Experience in advanced scanning probe methods and theory including multifrequency, dynamic methods, nanoindentation, advanced image analysis, nanothermal analysis methods, tip-sample interaction simulations and continuum contact mechanics is strongly desired. Excellent collaboration and communication skills are required. That sounds cool, but I'm not sure I really understand it. Edgewood, MD: OptiMetrics is a government contractor; they're looking for a Ph.D. computational chemist to help them with hazardous chemical contamination/decontamination modeling. Alexandria, VA: The Institute for Defense Analyses is hiring a M.S./Ph.D. scientist to be a research analyst in the system evaluation division; national security experience is a strong plus. US citizenship required. Chapel Hill, NC: The UNC Eshelman School of Pharmacy wishes to hire an assistant professor of medicinal chemistry and chemical biology. Ph.D. in organic chemistry, medicinal chemistry with experience in chemical epigenetics desired. East Lansing, MI: The National Superconducting Cyclotron Laboratory wishes to hire a staff member in nuclear chemistry at the assistant professor level; you will have a joint appointment in the department of chemistry. Sounds interesting. Rainmaker needed: The University of Akron's Deparment of Polymer Science is looking for a director of development with 4 years of experience in fundraising. This would be a pretty cool job, if you liked asking people for money. Full-time, non-tenure-track position. Appointment beginning August 2012 for 2012–2013 academic year, possibility of renewal up to two additional academic years. Recent chemistry Ph.D. required, organic chemistry or biochemistry preferred. Duties include class and laboratory instruction, supervision of undergraduate research. How is it labeled? "Chemistry Postdoctoral Teaching Position." Well, sign me up! Small College of the Week: Luther College (Decorah, IA, student population: 2,500, SA-LUTE!) is looking for a one-year chemistry laboratory coordinator. Minimum M.S. degree desired. The long term unemployed: forgotten? Why is it bad that people are unemployed for a long time? The longer people are unemployed, the harder it is for them to find a job (even after you control for skills, education, and so on). Being out of a job can erode people’s confidence and their sense of possibility; and employers, often unfairly, tend to take long-term unemployment as a signal that something is wrong. A more insidious factor is that long-term unemployment can start to erode job skills, making people less employable. One extraordinary study of Swedish workers, for instance, found that there was a strong correlation between time out of work and declining skills: workers who had been out of work for a year saw their relative ability to do something as simple as process and use printed information drop by five percentile points. My speculation: I suspect there is an unusually high number of older chemists in the long-term unemployed numbers; I suspect many of them have been forced into early retirement by layoffs, plant closures and their difficulty in finding a new position. Certainly, the bump in unemployment in cohorts older than 40 in the ACS member unemployment rate is evidence of (or does not refute) this problem. One last thing: look at that average length of unemployment. 40 weeks. 40 weeks! That's 10 months, or 77% of a year. Financial gurus who tell you that a family's emergency fund should be smaller than 6 months are actively doing their patrons a disservice. In my opinion, a proper emergency fund should be much closer to 12 months' expenses. C&EN: What do you do with a house full of explosives? Burn it down, of course. Technicians searching the grounds initially turned up six quart-sized jars filled with a white substance, 200 lb of lead sheeting, and gallons of concentrated acids as well as chloroform, hexamine, acetone, and hydrogen peroxide. Officials searching records on the property and on Jakubec learned that he had purchased castor plants. The poisonous protein ricin is isolated from castor bean oil. 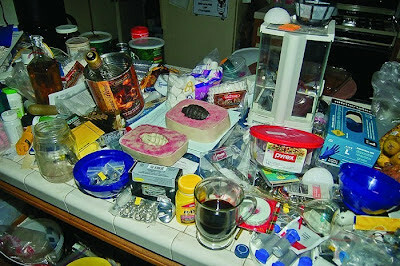 The discoveries left investigators concerned about explosive, radiological, chemical, and biological hazards at the site. To determine what was there, Vent and colleagues took air samples for biological agents and combustible compounds and sent in radiation detectors with the bomb technicians who searched the property while outfitted in both explosion and hazmat gear. Also key to the investigation was a portable Raman spectroscopy unit with a flexible sampling probe that could analyze the contents of the jars through the glass, without moving the jars or unscrewing their metal lids, because technicians feared that the contents were friction- or shock-sensitive. A two-minute-delay timer on the Raman unit was therefore also a critical feature, so a bomb technician could set up the unit and retreat to a safe distance before the laser fired. It took a few tries to figure out how to get good spectra through the thick glass of the jars, Vent noted, but investigators eventually identified the jar contents as hexamethylene triperoxide diamine (HMTD), an explosive compound that is sensitive to heat, shock, and friction. On Friday, Nov. 19, officials shut down I-15 while a robot picked up the jars one at a time, moved them to a relatively safe location, and detonated them. That's a pretty cool piece of technology, that Raman unit. I think there's a lab or two in this country that could use such a unit to open some cabinet doors and check some stuff out. Seriously, the story gets hairier than what I've excerpted above. Go over there and read it. Priced at a premium and sometimes offered via exclusive contract to drug and biopharmaceutical companies, niche generics have much in common with exclusively synthesized, patented APIs. Although they are not protected by patents and in principle can be manufactured by anyone, many niche generics require innovative chemistry of the sort that may elude Asian competitors. Several API producers in the U.S. and Europe say niche generics have increased in importance in recent years, given the drop in exclusive synthesis business following the financial meltdown of 2008. But taking advantage of opportunities in niche generics requires companies to embrace process development and regulatory approval challenges that dissuade newcomers from jumping into the fray. Irix Pharmaceuticals has taken up niche generics more recently, with a focus on prostaglandins and vitamin D chemistry. “We are using our expertise to create new technology or processes for molecules to counteract and balance the efficiencies companies would realize going to India and China,” says Panos Kalaritis, the firm’s chief operating officer. Much of that expertise stems from work he and Irix’ chief science officer, George Yiannikouros, did earlier in their careers at Roche. Two years into production, prostaglandins represent 10% of the company’s sales, Kalaritis says. He sees niche generics becoming increasingly important to Irix as a way to counter the whims that bedevil exclusive synthesis. Base load is an interesting concept in the chemical manufacturing business, especially since it seems to have been copied from the electric generation business. Wavefunction on Richard Zare's ACIE essay. Looking for #chemjobs in the UK? Lab Monkey is where they're at. John Borchardt talks about balancing work and life. Liberal Arts Chemist tells a story about a former student. Sad, but worth it. John talks rubber glove safety with an industrial hygienist. Chemistry Blog is rockin' these days. ChemBark: Are grad students in superlabs expendable? Warning -- to leave a note in this thread, it must be at least 800 words. Historical accidents at Caltech, as recorded by Linus Pauling. Josh Bloom, making fun of WaPo commenters. Chemists and materials scientists use powerful microscopes to examine the structures of substances. Sigh. Looks like we have more explaining to do. 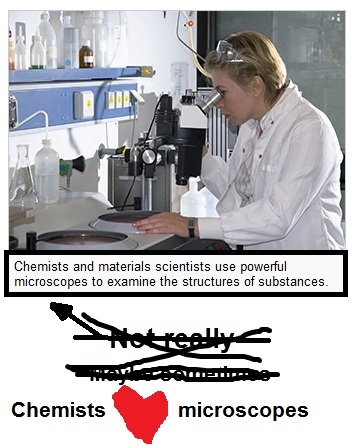 Chemists love, love, love microscopes!!111!Eleventy! UPDATE 2: That's 3 4 5 commenters weighing in with uses of microscopes in chemistry and materials science. I surrender. Starting salary of a chemical engineer today is? 120 [thousand] That's shortage. Last time I checked that's a good market, guys. You know? Demand's high, supply is short. Contrast that with AICHE's blog, where the median starting salary of a B.S. 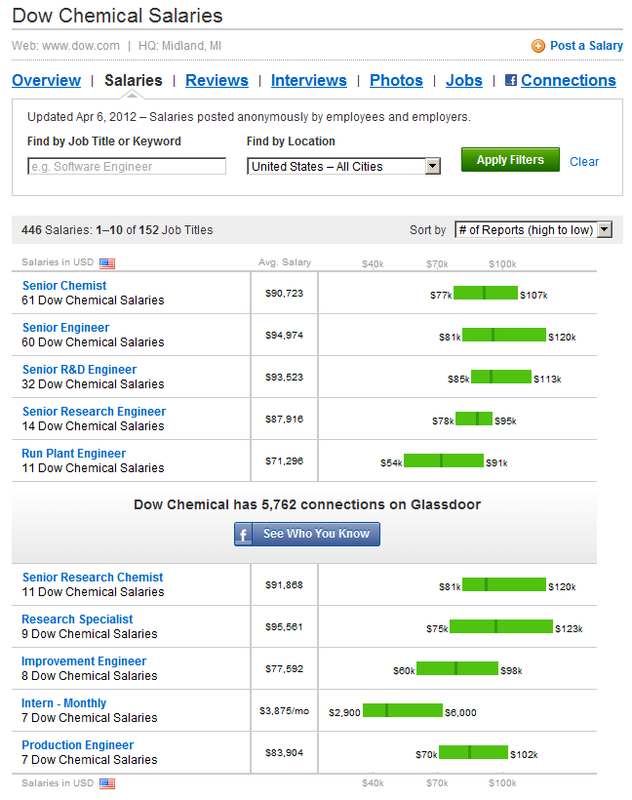 chemical engineer (via Payscale.com) is [drumroll!] around $65k. AICHE's 2011 salary survey (unlinked to respect member exclusivity -- you can Google it) confirms that range. 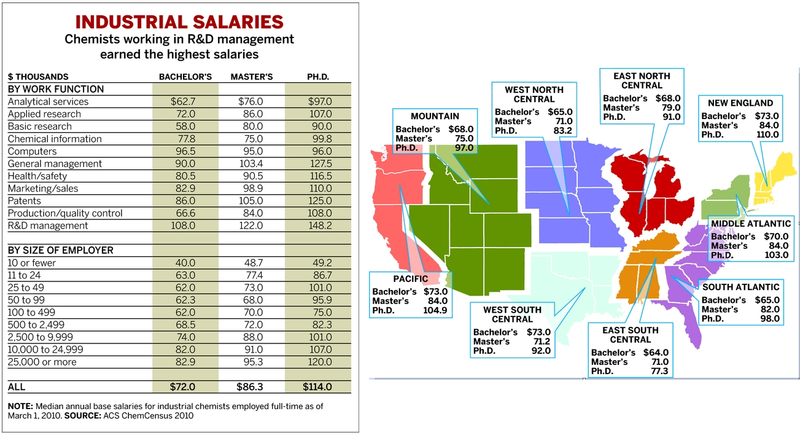 What's the median overall salary for AICHE's 2011 salary survey? $110,000. Dow is paying their starting chemical engineers $120,000 and Liveris is reporting the truth. Dow is paying really good for the industry right now, and are handing out significant bonuses, which Liveris is conflating with salaries. Andrew Liveris is confusing median and starting salaries. Andrew Liveris is intentionally lying about chemical engineer starting salaries. I would really like to know which one of those is true. Readers? But Liveris, whose company employs 24,000 people in the U.S. alone, says he can't get enough good workers here. "The starting salary of a chemical engineer is $85,000," he said. "And I can't get chemical engineers." I think Mr. Liveris needs to go on the gold standard. According to Glassdoor.com, 120 K is at the high end of the senior engineer pay scale at Dow. Senior chemists and senior engineers are early career PhD's, mostly recent hires. In principle, Mr. Liveris is not necessarily fibbing, he just neglected to mention that the qualifications for that salary are a PhD, a stellar job talk and interview, and the candidate would probably have a number of offers from competing companies. I know a newly minted chemistry PhD that just landed a senior chemist position at Dow starting at 95 K. I've always heard that engineers made about 20% more than chemists, so it appears consistent. In any event, I wouldn't mind getting a foot in the door at Dow. From the newest projections from the Bureau of Labor Statistics Occupational Outlook Handbook comes the numbers for predicted chemist employment in 2020. As you can see, chemical manufacturing is slated to suffer a 5.7% drop in chemist employment over the next 8 years. Basic chemical manufacturing (-15.1%), pesticide, fertilizer and other agricultural chemical manufacturing (-22.2%) and paint manufacturing (-11.3%) seem slated for especially large drops. Pharmaceutical manufacturing, it appears, will drop slightly (-0.7%). Good morning! Between April 17 and April 18, there were 38 new positions posted on the ACS Careers website. Of these, 3 (8%) were academically connected and 25 (66%) were from Kelly Scientific Resources. Hangin' with Dr. Liveris: Dow Chemical (Freeport, TX) would like to hire a Ph.D. chemist for the study of propylene production processes. Zeroes! : Eastman Chemical Company has been hiring fairly regularly over the life of the blog and the DPT; they're hiring two chemists (Ph.D., 0-5 years experience, B.S./M.S., 5-10 years) for their polymer processing groups. Oh, dear: Kelly Scientific -- why do you pain me so? A call center in Grand Island, New York, paying $11-$13/hour? That's not even worth the price of the ad, is it? 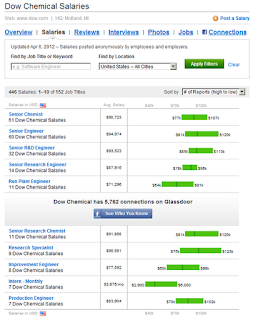 A broader look: Monster, Careerbuilder, Indeed and USAjobs.gov show (respectively) 275, 752, 3,062 and 46 positions for the search term "chemist." The Persians then began to synthesize compounds to attempt to cure the maladies that befell them, the Phoenicians working on a series of triazoles, and the Egyptians concentrating on a set of azaindoles. But no sooner had the compounds been submitted for biological testing than the word came back from quality control that their compounds were impure. 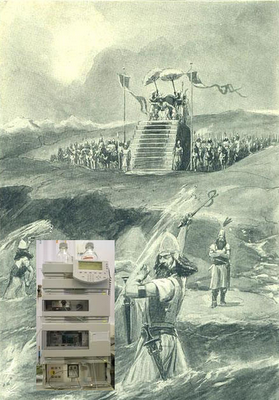 Xerxes the project manager flew into a rage at this, and he commanded that the HPLC be struck with three hundred strokes of the whip and that a pair of foot-chains be attached to its pump. He also commanded the analysts to speak outlandish and arrogant words: "You hateful instrument, our master lays his judgment on you thus, for you have unjustly punished the team even though we have done you no wrong and performed our necessary preventative maintenance! Xerxes the project manager will succeed, whether you wish it or not! It is fitting that no chemist offer you sacrifices, for you are a faithless tool!" In these ways he commanded that the HPLC be punished and also that the heads be severed from all those who led the project subgroups. We are looking for an analytical laboratory that has experience in testing the quality of herbal and fungal materials used as ingredients in Traditional Chinese Medicine (TCM). We are looking for analysis of proprietary formulations from a contract lab as part of our QA/QC program under DSHEA. The products are dietary supplements. Readers with contacts or connections, please e-mail me at chemjobber -at- gmail/dot/com or write in the comments. I think SeeArrOh beat out John of The Rheo Thing (our first point ever), BethE and boooooooya for typospotting last week. SAO, if you could send me a topic by this Friday, your requested post will be up by Wednesday next week. Mixing and stirring. The presence of two phases in a reactor/vessel can lead to the generation of charge on stirring. The higher the agitation speed the greater the charge generation. In certain systems where a solid is being dissolved into a liquid, very high electrostatic charges can be generated. In this case special precautions may be required. If a large-enough electrostatic charge is present in the solvent and there is an earthed object in close proximity, then a discharge or spark can occur. If there is a flammable atmosphere present and the spark has enough energy to ignite the solvent, then a fire can occur. There are many case histories where fires have been started due to static discharges from liquids involving a range of low-conductivity solvents. A nitrogen blanket can be used to prevent a flammable atmosphere, but this can still lead to problems with reactor pitting. An example of this is the damage caused to enamellined reaction vessels due to discharges of static electricity. Enamel itself cannot become dangerously charged, unlike some plastics, and is therefore used extensively in the chemical and pharmaceutical industries. However, experience in the use of enamel vessels has shown that under certain conditions high electrostatic charging can occur and the sparks generated can cause pitting of the reactor wall. If this remains unchecked, it can lead to corrosion, extensive damage, reactor downtime, and even reactor replacement. Similar experiences have been seen for glass-lined reactors. One example is Octastat, which can improve the conductivity of solvents at ppm levels. A typical graph is shown in Figure 3 for the dosing of toluene with Octastat 3000. A dose level of 1-2 ppm is required to raise the conductivity above 1000 pS/m. The exact dosage for many of these additives depends on the particular solvent and the manufacturing process in which it is being used. It is therefore advised to measure the conductivity of the solvent directly using a conductivity meter for each application. In pipes another way of limiting the buildup of static is to reduce the flow velocity. The recommended maximum flow for a low conductivity solvent is 1 m/s where a solid or second liquid could be present. Otherwise a maximum limit of 7 m/s is suggested. With conducting liquids in metal pipes, flow control is rarely required. A careful selection of inlet and outlet points can help minimise the problems of static generation due to splashing, as does the use of wide bore valves. I'm sure there's a scaling reason as to why we tend not to worry about these sorts of things in lab-scale reactions. Probably has something to do with charge density (?). Giles, M.R. "Electrostatic Hazards in Liquids and Relevance to Process Chemistry." Org. Process. Res. Dev. 2003, 7, 1048−1050. His [Cowen's] work leaves the impression that there are two interrelated American economies. On the one hand, there is the globalized tradable sector — companies that have to compete with everybody everywhere. These companies, with the sword of foreign competition hanging over them, have become relentlessly dynamic and very (sometimes brutally) efficient. On the other hand, there is a large sector of the economy that does not face this global competition — health care, education and government. Leaders in this economy try to improve productivity and use new technologies, but they are not compelled by do-or-die pressure, and their pace of change is slower. A rift is opening up. The first, globalized sector is producing a lot of the productivity gains, but it is not producing a lot of the jobs. The second more protected sector is producing more jobs, but not as many productivity gains. The hypercompetitive globalized economy generates enormous profits, while the second, less tradable economy is where more Americans actually live. In politics, we are beginning to see conflicts between those who live in Economy I and those who live in Economy II. Republicans often live in and love the efficient globalized sector and believe it should be a model for the entire society. They want to use private health care markets and choice-oriented education reforms to make society as dynamic, creative and efficient as Economy I.
Democrats are more likely to live in and respect the values of the second sector. They emphasize the destructive side of Economy I streamlining — the huge profits at the top and the stagnant wages at the middle. They want to tamp down some of the streamlining in the global economy sector and protect health care, education and government from its remorseless logic. First of all, I'm not really interested in exploring the elephant-vs-donkey aspect of Brooks' column. But I'm really struck by how this explains many of the great divisions within the American Chemical Society and its members. The big issues (open-access, #chemjobs, immigration lobbying, climate change and the leadership of ACS and the editorial direction of its flagship newsweekly (C&EN)) can all be seen as proxy wars between ACS' Economy I and Economy II members. Of course, there are battles within the Economy I and II sectors as well -- the management class (non-bench workers, PhDs, seemingly protected from the greatest pressures) versus the bench chemists, etc., etc. An example of the irritation that can be engendered by Economy I and II debates is the battle between industry hiring managers and academics over training of young chemists. When industrial chemists say things like "academia needs to do a better job of training", academics tend to hear "you tenure-protected Economy II members have no idea what it's like over here in Economy I, and I'd like you to do for free what I used to pay for." When government and academic scientists (and the editor-in-chief of C&EN!) talk about the perils of climate change, industrial chemists hear "you Economy I people are making our way of life worse, and I'd like to change that by raising your costs and making it harder for you to do business." Even as both of these comments are obvious caricatures, I'll bet they sound familiar, at least. I doubt the ACS can manage to solve these differences; they're with us and they always will be. But I think that Brooks is right -- the Two Economies are growing apart, and the split within ACS along that rift will only grow wider. Good morning! Between April 12 and April 16, there were 50 new positions posted on the ACS Careers website. Of these, 5 (10%) were academically connected and 21 (42%) were positions from Kelly Scientific Resources. Location unknown: Life Technologies would like to hire a Ph.D. analytical chemist with expertise in LC/MS for a staff scientist position. West Deptford, NJ: Johnson Matthey is looking for a Ph.D. organometallic chemist for a research and scale-up position; sounds like you'll be coordinating overseas research as well. A big move: Shimadzu has posted 8 positions throughout the US in all fields (sales, technical support, etc. ), such as this LC/MS position in Pleasanton, CA. Fragments: Have experience in fragment-based lead generation-based drug discovery? AstraZeneca would like to hire you as an associate director at its Waltham, MA site. Below the bar: The National University of Ireland, Galway is looking for a lecturer in inorganic chemistry (below the bar). That apparently is equivalent to an assistant professor position; doesn't look like it pays too badly. Altoona, PA: Penn State - Altoona is looking for a one-year visiting professor of chemistry. I wonder if Mr. Colton's note has a sentence edited out of it, such as 'it's too bad that current economic times are hitting specialty synthetic companies particularly hard' or something like that. Certainly USPTO's one open chemistry position (at the moment) looks to require a fairly intense industrial background. There are a number of internship programs, which I'm sure he was referring to. It would be easy to start an intergenerational flame war, but that wouldn't be wise nor constructive. So I simply suggest to Mr. Colton that he recognize the current state of the chemistry job market (especially for young people), its historically bad nature and ponder whether to factor that into his future advice. Chemist Andrew K. Boal took this route by joining MIOX, a small firm in Albuquerque, N.M., specializing in water treatment technologies, in 2008. “I’ve done everything from making sales calls to doing a presentation of our technology directly to a customer to doing trade shows where I talk to potential customers about the technology,” he says. These experiences were eye-opening. “There are so many things that go into developing a successful technology beyond just whether or not your chemistry works that simply hadn’t crossed my mind,” he says. Ultimately, the hope is that these investments will also pay off in creating more jobs for chemists. For Beckman, that’s been his greatest source of pride. “I like the notion that thanks to something I did in the lab a long time ago, there are 30 people with jobs,” he says. Attila E. Pavlath’s letter says what so many industrial chemists have long known: Academia does not gear training for where most of the jobs are. But it’s time to stop wringing our hands and work around the situation (C&EN, Feb. 27, page 2). More retired chemists should share their know-how by blogging and setting up webpages. You can read my process development blog online at kilomentor.chemicalblogs.com. More than 110 articles have received more than 170,000 visits since it was started. It’s free and available worldwide. Let’s start doing our own educating. Thanks for all you do, kilomentor. 3. Where your secret tattoo will be: inside your wrist, or on the nape of the neck? 7. Who would play them in the movie of their life: Sean Connery/Meryl Streep or Johnny Depp/Natalie Portman? What's the small company discount? So the median Ph.D. industrial chemist makes 114k. The small company discount is HUGE; the median small company chemist (less than 25 employees) either makes 49k or 86k. As you can see on the right, all the Midwestern areas have median salaries for Ph.D. chemists that are significantly different from the median Ph.D. salary. Also, (not pictured) there's quite a drop between the 50th percentile for a young industrial Ph.D. chemist (87k) and "the median chemist." Sorry -- probably news that you don't want to hear, reader. I'm probably seriously comparing kumquats and bananas here, so take it with a grain of salt. Readers, what do you think? So this is the last ten years or so of Bureau of Labor Statistics projections for job growth for chemist jobs (or #chemjobs, for the Twitter folks) drawn from these tables. Here's a Google documents version of the above table. What conclusions can I draw? The data is quite clear -- chemistry has not been a "higher than average" job growth field since 2001. If you were an entering graduate student in 2001 and you left graduate school in 2006 (or took a postdoc) and left in 2008, your projected future was a lot different than when you started. This is an interesting set of data to ponder. The BLS folks have a difficult job, attempting to guesstimate what job growth in a field might look like, ten years ahead. I don't think they anticipated the Great Recession, for example, in their data set. Well, yet another piece of data to keep in mind for the blog. 2. Group rates on access to journals and library services. Yes, some of you could go to university libraries and look these things up and print off articles to read at home, but some of you can't. You're probably violating some sort of terms of service agreement the library and publisher worked out anyway. It's not like anyone is likely to bust you unless you print out stacks and stacks of papers, but still. It's one more hassle for a small company to deal with, and everyone will have to re-invent the wheel and waste time and energy negotiating access on their own. I think that's an excellent idea, as someone who enjoyed darn near universal access to everything during my academic/early industrial career and now suffers along without access to a lot of the chemical literature. I'm regularly making trips to the local university library (closed on Sunday?!?! Darn you!). Of course, those trips (and their success) depends on the library you're going to. My local public university library used to be superb -- now, not so much. This brings us to ACS Member E-Passport, which offers the chemist the fabulous deal of 500 articles for $1000. From ACS Publications' perspective, this is a great deal -- they're offering you articles at $2 per, as opposed to the $35 that you might normally pay. From my perspective, no deal. For $1000 a year (a price, I might add, that I would be willing to think about**), I want demand would prefer universal access to everything. If I pay $500 to this new organization and they offer me universal access to all the major publishing houses, I'd be all for it. *What is that a reference to? The NJ governor's wife? The US Bureau of Labor Statistics has published its latest projections of job growth for chemists for the next decade recently. Overall job growth for all occupations is expected to increase by 14%; by contrast, chemists will experience 4% job growth over the next 4 years. I think it's interesting that the change in job growth is different (revised upwards) from 2010, even as the number of chemists has actually gone down (2,100 fewer chemists in 2010 than in 2008 -- totally believeable.) The numbers in the attached Excel spreadsheet are a gold mine of data that I'll be unearthing on a regular basis. Declines in employment of chemists is [sic] expected at chemical and drug manufacturers. To control costs and minimize risks, many of these companies are expected to partner with research universities and smaller scientific research and development (R&D) and testing services firms to perform work formerly done by in-house chemists. Additionally, companies in these industries are expected to conduct an increasing amount of manufacturing and R&D in other countries, further limiting domestic employment growth. That the leadership of the American Chemical Society is not directly addressing this issue (i.e. slow job growth, continued shedding of industrially-employed chemists) with its members on a regular basis is a frustrating, disappointing thing. While perhaps overwrought, the concept of "fiddling while Rome burns" comes to mind. Good morning! Between April 10 and April 11, there were 10 new positions posted on the ACS Career website. Of these, 2 (20%) of the positions are academically connected and 3 (30%) are from Kelly Scientific Resources. Pittsburgh, PA: PPG Industries is looking for a B.S. chemist to be a research technologist; experience with resin synthesis desired. Mont Belvieu, TX: Enterprise Products Company is an oil services firm; they would like to hire a B.S. analytical chemist with GC and methods development experience. Fair Lawn, NJ: SK Life Sciences is looking for a M.S./Ph.D. chemist to be a marketing assistant manager; I suspect you'll be drumming up work for the home office in South Korea. Also desired: "Harmonious relationship with good communication." A broader look: Monster, Careerbuilder, Indeed and USAjobs.gov show 255, 2192, 2959 and 46 positions for the search term "chemist." By the summer of '85 I had been through the Three Phases of the White House. The first is, "Gee these people are gonna be so smart," and you keep quiet so no one knows how dumb you are. The second is, "Hey, I'm as bright as the other guys," and the affirmation makes you generous, the happy pride makes you nicer to the lady in the cafeteria. But you're also a little disappointed, because you wanted to learn. The third is, "Oh my God, we're in charge?" And you start having mild anxiety attacks and talking too much. At this point you redefine things, rearrange your concept of competence, knowing that this White House couldn't be worse than any of the other; it has its share of fools, but that's not new, and we always survive. And you realize there isn't, as you'd thought when you were young and in school, a place full of excellence and truly superior people. There is no safe place of high merit. Because if it isn't here, it isn't. There's a lot to quibble with that passage, but it has its share of truth. For the commenter that spots the most typos in each one-week period and either comments or e-mails (chemjobber -at- gmaildotcom), that commenter will be granted a post written by me on any desired topic. I think good or bad numbers like these are meaningless. Number of offers made based on career fair interviews - now that's something I'd love seeing! The question raised by Anonymous is a good one. We ask our employers if they made offers, and we ask job seekers if they received them; however, neither group is good about returning information to us. It is also important to note that very few actual offers are made at career fairs. Most employers are using the career fair as a first screen. Therefore, it is more realistic to look for the number of people that received follow up interviews, or invitations for site visits. We don’t have good numbers for those either. Therefore, we concentrate on the variables that are most within our domain of control and/or influence. Namely, I look at the number of employers and the number of jobs they bring. In recent years, several things have changed making it harder to attract employers. The biggest change is the availability of job seekers. Employers have more candidates to choose from than ever before, and those candidates are actively searching out opportunities. Therefore, employers don’t have to come to us, because, job seekers will go directly to them. The second factor affecting onsite job fairs is that most employers are listing two or three jobs instead of 100 or more. With that reduction in volume, many companies decide that it is not economically feasible to send a hiring manager to a meeting for several days to recruit. The cost of travel and missed days on the job is greater than the gain of one or two people. For this reason, we coupled our onsite career fair with our virtual career fair, and I look at them as one hybrid event. Attending the virtual fair eliminates travel costs and losses of productivity. We have been able to grow the number of jobs and the number of employers through this strategy. With regard to interviews, the number one factor determining whether a candidate gets one is their application package. This is out of our immediate control, but we can help. At the last meeting, we doubled-down on our workshops with a new series called the Chemical Career Pathways series. In the workshops we explore careers in four different sectors: higher education, industry, government, and self-employment. We explore strategies to successfully address the application process in each sector with the exception of self-employment. For self-employment, we lead attendees through the creation of a business plan. We also offer resume reviews and mock interviews onsite and online to our members. We know from surveys that going through the resume review process increases a candidate’s chances of a callback fivefold. The Chemical Career Pathways series was piloted in San Diego. We are currently optimizing the content based on participant feedback, and we will roll out the full-scale program this fall. The second stumbling block for candidates is the interview process. Again, we have beefed up our workshops and advice. We also have onsite mock interviews, and an online practice interview program called InterviewStream. Going through a practice interview with either system will increase a candidates chances of success significantly. For the onsite program, we staffed the mock interview booths with hiring managers and HR consultants from ACS. This is a big problem, especially for new graduates and postdocs, but we are trying to help in the ways that we can. We are also open to advice, constructive criticism, and suggestions through careers@acs.org. I'd like to hear from readers if they participated in the Chemical Career Pathways series -- it'd be interesting to know both what you thought of it and how your job hunt is going. Credit: Grongsaard et al., Org. Process. Res. Dev. The reactor was constructed of 0.25-in. internal diameter stainless steel tubing and immersed in a dry ice/acetone bath to maintain a low temperature. Reagent streams were fed by peristaltic pumps with pressure gauges (PI) through polytetraﬂuoroethylene (PTFE) tubing. 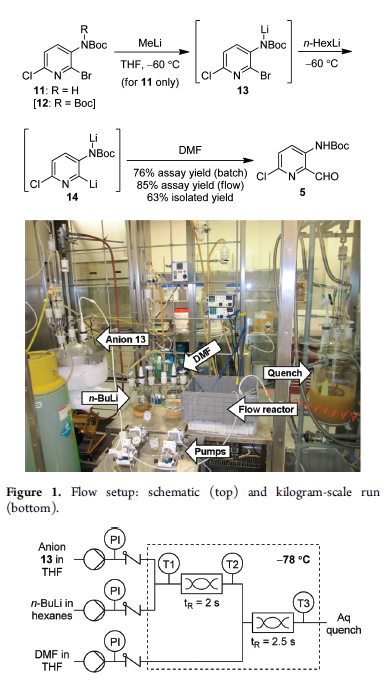 [snip] To demonstrate proof-of-principle for this process, a preparative scale run was perfomed using the setup shown at the bottom of Figure 1. The anion 13 derived from 1 kg of bromide 11 was processed through the ﬂow reactor in 1 h, at a ﬂow rate of 114 mL/min. Eﬃcient cooling of the system in the rudimentary cold bath was maintained even at this high ﬂow rate (the temperatures recorded at steady-state were −70, −65, and −55 °C at T1, T2, and T3, respectively). The solution assay yield of aldehyde 5 at the end of the run (85%) was higher than on the 5 kg scale in batch mode (76%), and the level of debrominated side-product was lower (4% vs 7−8%). Furthermore, even with a slightly higher concentration of dianion 14 in ﬂow mode (in 7 volumes of solvent compared to 10 in batch mode), no gelling or plugging of the reactor was observed. (I think the high-tech flow reactor cooling vessel is a big plastic box, if I'm not mistaken.) A pretty neat experiment -- and a challenge to all of us to try flow chemistry. About a year ago, I wrote up a little criticism of the University of Florida's "Master's Program in Pharmaceutical Chemistry". I mainly focused on the tradeoff of cost; that is, in a typical master's program in chemistry in the United States, they pay you*. In a distance program, you pay them; $16,800 for the UF program, it looks like: 32 credit hours X $525/hr. I also cast doubt on the willingness of employers to accept this credential over a traditional M.S. degree. I'm part of this program and the material is no "cake walk", and they use several tools to adequately "compensate" for anything potentially lacking due to the inherent nature of distance learning (with a possible exception for benchwork which most students already have in spades given that most of them are currently working in the industry---and which others already have from undergraduate or additional studies). As to certain employers not viewing this degree as having the prestige of a "live" program---screw 'em. Any employer in today's world that automatically, totally discounts an on-line degree is an inflexible dinosaur (with a higher likelihood of failing) that I likely wouldn't care to make a career with anyway. While they are certainly free to question the sufficiency of a particular individual's preparedness (as they would any job candidate), and while the school has certainly adapted to find new ways to raise some revenue in this more interconnected world; this particular degree is sound, and anyone completing it should be viewed as being self-disciplined enough to complete a major project without much prodding/nursing. I do not believe the school is overselling the usefulness of this degree. No one has promised me I'll be able to secure a golden ticket at the end of my studies. However, they likely do not want to advertise in big letters that the U.S. medicinal chemistry market is likely oversaturated in the short term with very skilled people. I don't know if I agree with this statement; I found it somewhat unconvincing. But, as I thought about it, it brought to my mind one of the benefits of bricks-and-mortar graduate school: group meeting. I don't really miss group meeting very much. I spent a lot of time being very bored by it. But to be sitting in a room for (at least!) 2 hours a week, 45+ times a year with my professor and his students, discussing our research results, research results in the literature and (occasionally) the direction of the industry was really, really important and formative. You learn how to analyze other people's results, how to think critically about the literature and to sit and listen to your professor's opinions and the opinions (informed or not) of your colleagues. I think I learned all the important principles of organic reaction mechanisms (again and again and again) by sitting in a windowless room lit by fluorescent lights with uncomfortable chairs, trying to figure out why you get this isomer as opposed to that isomer. Where are you going to learn how to answer questions under fire? Where are you going to learn how to defend your research results? I do not believe that distance learning can simulate this experience. As I said, at some point in the future, I'm sure that distance-based graduate school will be equivalent to a traditional program and these technological hurdles will somehow be overcome. But for the moment, I do not think that you will learn as much in a distance program as opposed to a traditional master's program. *Granted, there is opportunity cost to be calculated. 2 years in school is 2 years out of the job market. What makes a good team name? Quote of the day: "Crazy Time"